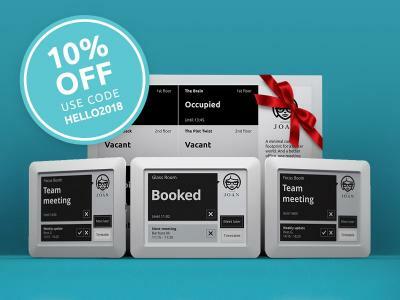 Visionect is celebrating the end of 2017 and the company is offering a 6" discount on its JOAN family of E Ink signage displays - the 6" JOAN Manager, 6" JOAN Executive and 13" JOAN Board. Visionect also offers free shipping. To enjoy this discount, use the coupon code HELLO2018 when you checkout. The JOAN signage solutions are installation-free battery-powered wireless E Ink conference room management signage solutions. Visionect says that since the launch of the JOAN series last year it has signed on over 1,600 customers in North America alone with thousands of devices deployed worldwide. MpicoSys' PicoSign is a universal signage system that includes an E Ink display and internet connectivity (via Wi-Fi or POE). PicoSign runs on 4 standard AA batteries that can operate for more than a year (the 10.2" model, updated 7 times a day via Wi-Fi, will last over a year). 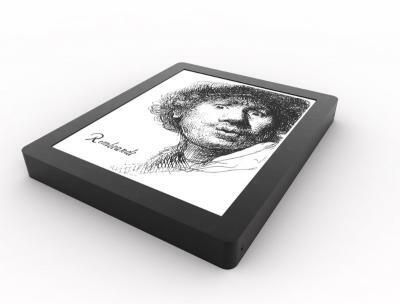 The PicoSign series ranges from 7.4" 480x800 to a color 31.2" 2560x1440 E Ink Carta display. MpicoSys' PicoLabel is a no-battery signage display that includes a 2.7" 264x176 E Ink display updated via NFC. Target applications include Logistics (manufacturing, warehousing, transportation, Badges), authentication and door signage. 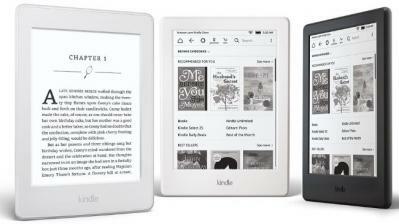 Amazon launched its first Kindle device 10 years ago, and the retail giant is celebrating this event by offering a $30 discount on its 2017 Kindle, Kindle Paperwhite and Kindle Voyage devices. You can enjoy this discount till the end of the day (October 25) - the Kindle is now at only $49.99, the Kindle Paperwhite at $89.99 and the Kindle Voyage at $169.99. These are the prices for the special offers editions (ad supported). 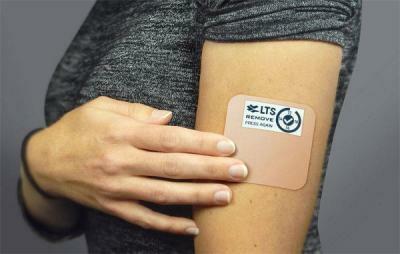 E Ink Holdings and and LTS (Lohmann-Therapie Systeme) AG announced a partnership to co-develop an e-paper powered smart medical patch solution. The Transdermal Therapeutic System (TTS), which delivers medication to patients directly, features an E Ink display to display the statue of the delivery system. The current prototype that has been developed use a 2-inch E Ink display, a switch and a pressure sensor. The display has several options, including a timer, corrector and reminder. E Ink says that this is the first application to use E Ink's new low-voltage film that uses 50-70% of the typical driving voltage for E Ink displays, and so can be used with a smaller battery than before. Visionect recently appointed Sri Pervuemba to its board of directory. Sri is a long time display veteran and was E Ink's chief marketing manager for over 10 years. Sri is also a good friend and has been supporting E-Ink-Info from its launch. Sri was kind enough to answer a few questions we had regarding the e-paper market and Visionect's technology and platform. But first, an official bio: Sri Peruvemba is the CEO of Marketer International. His 25 years of experience in the electronics industry include marketing LCD, CRT, TFEL, OLED, LED, Plasma and ePaper displays into the consumer, mobile, industrial, medical, signage and TV markets. He earned a BSEE, a MBA and a Post Graduate Diploma in Management. He was previously CMO for E Ink and also held senior level positions at Sharp Corp, TFS Inc., Planar Systems and Suntronic Technology. Peruvemba currently serves as Director on the Board of Visionect Inc., as well as on the board of the Society for Information Display(SID). 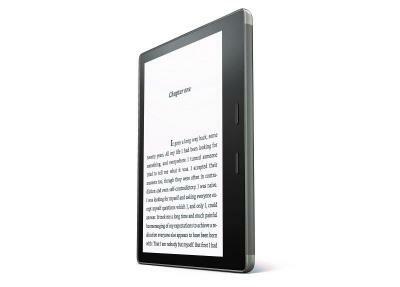 E Ink Holdings reported its financial results for Q3 2017, saying that revenues are at a 4-year high due to sales of 7" e-paper displays for Amazon's latest Kindle Oasis. Revenues reached just over $56 million, up 3.3% from August and up 11.3% from September 2016. Revenues for Q3 2017 reached $158 million, up 29.8% from Q2 2017 and up 7.8% from Q3 2016. 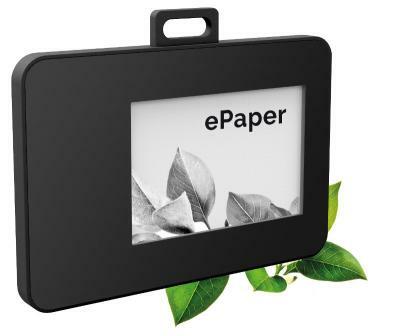 E Ink says that its smart labels, smart card and e-reader displays are all growing fast since the beginning of 2017. The company expects its electronic shelf label sales to peak in the second half of 2017 with a year-on-year growth rate of 20-30% in 2017. Visionect announced a new product, the JOAN Classroom - a scheduling system aimed to help K–12 and higher education institutions manage their rooms and resources more efficiently. 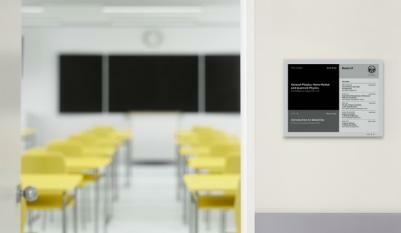 The JOAN Classroom is based on a 13" 1600x1200 E Ink Carta display and can last for 12 months on battery. The JOAN Classroom is currently available in preorders, for a special preorder price, until November 7, 2017. Bookeen's Saga is a digital reader that features a 6" 1024x758 E Ink Carta display, front light, accelerometer (to automatically switch between left-handed and right-handed users) and a smart cover. The Saga will ship globally in November 2017. The Kindle Oasis is Amazon's flagships e-paper e-reader device. The 2017 edition features a 7" 300 DPI E Ink display (larger than previous Kindle e-readers) and is waterproof (IPX8) and supports audible books. The Oasis 2017 comes in either 8 GB or 32GB. Amazon will ship its new Oasis Kindles by the end of October 2017, price starts at $249.99 for the Wi-Fi 8GB model. The 32GB Cellular model costs $349.99.